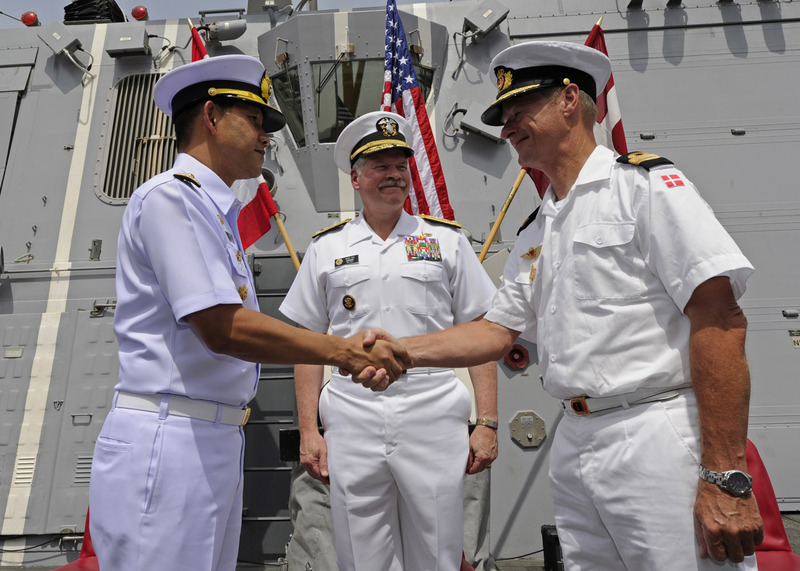 Rear Admiral Tanin Likitawong, Royal Thai Navy, relieved Commodore Aage Buur Jensen, Royal Danish Navy, as Commander Combined Task Force (CTF) 151, during a change of command ceremony onboard USS Halsey (DDG 97), Muscat, Oman, March 29. 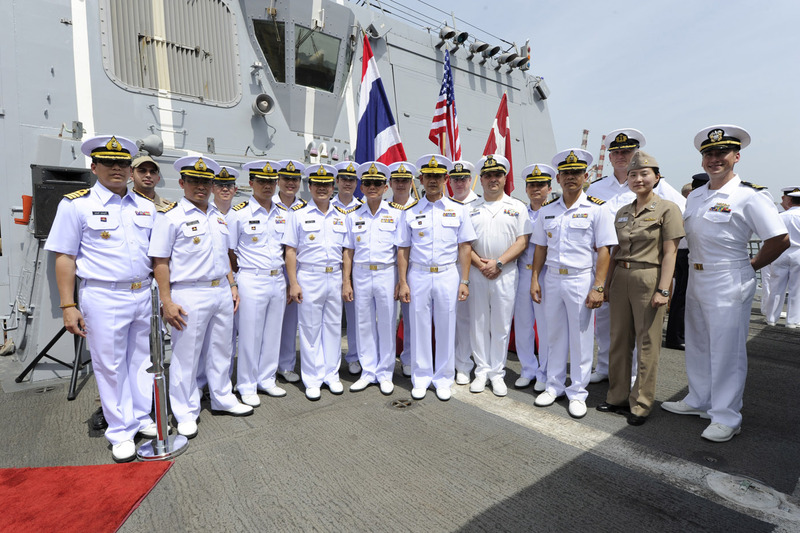 Rear Adm Tanin Likitawong Royal Thai Navy, relieves Cdre Aage Buur Jensen Royal Danish Navy, of Command CTF 151. The ceremony concluded the Royal Danish Navy’s first command of CTF 151, which consisted of a multi-national staff embarked in Halsey. The three month operation further strengthened ties with other counter-piracy naval forces on operations in the region, as well as further developing communication and collaboration within the merchant shipping community. Jensen’s tenure as Commander CTF 151 included visits at sea to the flagships of Commander CTF 465 European Naval Force (EUNAVFOR), Captain Jorge Manso, and Commander CTF 508 NATO, Rear Admiral Siman A. Tosum, as well as a meeting onboard the Admiral Tributs, flagship to Captain Ilder Ahmerov, Commander of the Russian counter-piracy task group in the region. Commodore Aage Buur Jensen said of his time as Commander CTF 151: “Counter-piracy is a matter of concern for all nations and should be dealt with by all nations.” He continued to highlight the coordination with the European Union, NATO, and independent deployers as being an outstanding example of international cooperation, with all partners showed willingness to do their upmost to achieve the common aim of defeating piracy. Since January CTF 151 has disrupted four piracy action groups (PAG), and conducted coastal monitoring for piracy activity along the northern area of the Horn of Africa, and the south Somali coast. International partnerships and eagerness to share information and assets has lead to a drop in piracy in the region. From the time January-March 2012 there was a decrease in piracy attacks on vessels from 41 to 11, and successful pirating from 13 to four over the same period in 2011. CTF 151 is a multi-national staff, who will be embarked in RFA Fort Victoria. CTF 151 is one of three taskforces under control of Combined Maritime Forces (CMF), based in Bahrain. CTF 151 was established in 2009 to deter, disrupt and suppress piracy, protect maritime vessels of any nationality and secure freedom of navigation for the benefit of all. CTF 151’s area of operation encompasses 1.1 million square miles in the Gulf of Aden and Somali Basin. 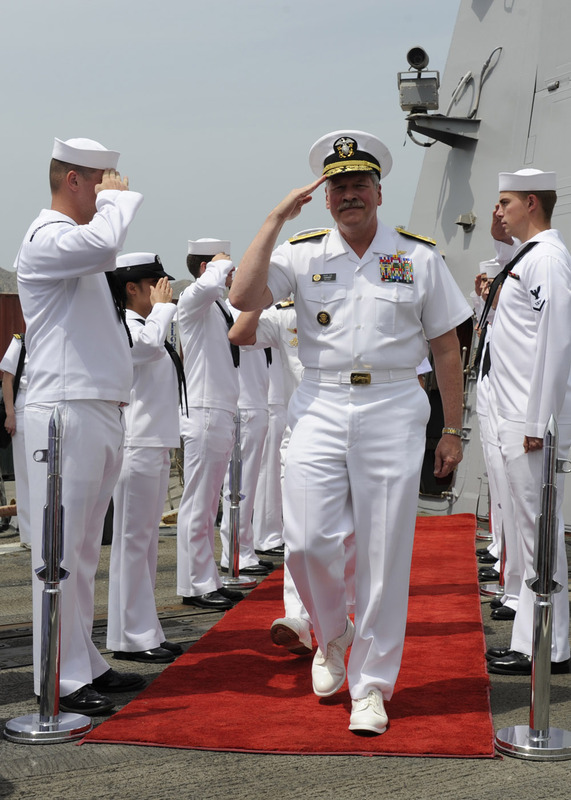 Vice Adm Mark Fox, Commander Combined Maritime Forces, attends CTF 151 Change of Command ceremony, Muscat, Oman.